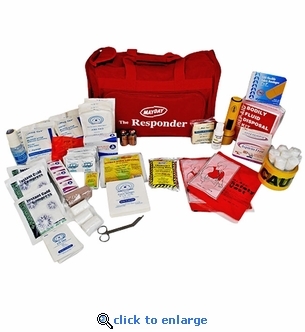 This First Aid Trauma Responder Kit will enable you to respond quickly with first aid supplies to help people with traumatic injuries. After an earthquake, tornado or hurricane, vital life saving emergency services may not be able to respond as fast as they'd like. Flooding, blocked roadways, and large scale devastation may prevent rescuers and medical teams from reaching your location for hours or days. Be prepared to help your family or neighbors survive a traumatic injury. This 25 person kit is ideal for the workplace, home or auto. This nickle-plated brass whistle is perfect for emergency kits, hiking, sports or getting attention. The emergency pea whistle is made from brass and then nickle plated for durability. Use to alert emergency responders to your location in a disaster or to scare away predators in the wilderness. Comes with a high-quality lanyard. Lanyard colors may vary.